Even before superhero movies were an annual summer staple, comic book heroes have been a part of my life. Because super hero’s backgrounds and powers are often reimagined and updated, they’ve kept their appeal and place in our popular culture. 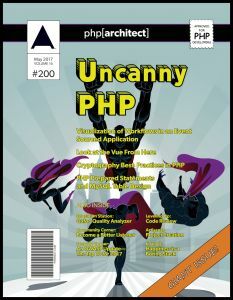 PHP’s continual popularity, which you’ve read about in these pages many times, is due to a similar impetus to evolve. PHP 7 brought static and return type hints a while the later 5.x releases made it easier to use functional programming techniques. In its early days, PHP’s popularity was boosted by how easy it was to extend and bring in new capabilities to your web applications. As the language we use evolves, make sure you’re staying relevant by expanding what’s in your utility belt.